One of the oldest sabhas in Chennai, Sri Parthasarathy Swami Sabha formed in 1900 continues to celebrate a long December Season every year. 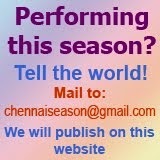 The concerts are held at Vidya Bharathi Kalyana Mandapam, 55, Bheemasena Garden Road (Near Jammi Building) Mylapore. 8.30 a.m “Carnataka Sangita Pitamaha Sri Purandaradasa.” by Sri. T.K. Govinda Rao, Musician & Musicologist. 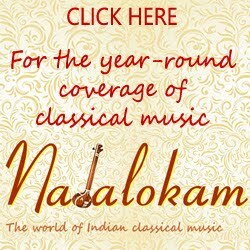 10.00 a.m. SRIRAM GANGADHARAN- Vocal ; R.Satishkumar – Violin ; Madipakkam Suresh – Mridangam ; Madipakkam Murali - Ghatam. 6.30 p.m. Dr. K.J. YESUDOSS - Vocal ; Mahadeva Sharma – Violin ; B.Harikumar – Mridangam ; Tiruppunithura Radhakrishan – Ghatam. 12.30 p.m. Kanakadurga Venkatesh - Vocal ; Dineshkumar – Violin ; B.Sundar – Mridangam. 2.00 p.m. S.M.Vilasini - Vocal ; Bombay Anand – Violin ; Sai Giridhar – Mridangam. 8.30 a.m “Mysore Sadasiva Rao and his Contributions” by Dr. Rajshri Ramakrishna, Lecturer, Dept. of Indian Music, Univ. of Madras. 8.30 a.m “Misra Nadai Pallavi in 4 kalai” by Chingleput Sri. Ranganathan, Principal,T.T.C., The Music Academy, Chennai. 8.30 a.m “Role of Madhyama in rakti Ragas” by Dr. R.S. Jayalakshmi, Lecturer, T.T.C. The Music Academy, Chennai. 8.30 a.m “Kuraippu in Kalpana Svara ” (Adi & Misra Chapu) by Trichy Sri. J.Venkataraman, Musician & Musicologist. 10.00 a.m. “Gamakas, Anuswaras – Oceans of Musical Possibilities”, Dr. Sriram Parasuram, Musician & Musicologist. 8.30 a.m “An ideal structure for Musical Composition” – A reflection of Past and Present by Smt. Suguna Purushothaman, Musician & Musicologist. 10.00 a.m. “Madhyamavathi Patterns” by `Nadha Yogi’ Prof. S.R. Janakiraman, Musician & Musicologist. Dept. of Indian Music, Univ. of Madras. 8.30 a.m “Contribution of Raja Raja Chola to the development of Art and Architecture” by Dr. B.M. Sundaram, Musicologist. Musical Presentation by Vasundara Rajagopal - Vocal ; B.Ananthakrishan – Violin ; Nellai Balaji – Mridangam. 8.30 a.m “Mumoorthigal Sangamam” by Neyveli Sri.R.Santhanagopalan, Musician & Musicologist. 8.30 a.m “Transition of Folk Tunes in to Ragas” by Dr. S.A.K. Durga, Emeritus Professor, Dept. of Indian Music, Univ. of Madras. 8.30 a.m “Lyrical excellence in the kritis of Sri Muthuswamy Dikshitar” by Smt. Sumathi Krishnan, Musician. Ganapathy & Kiran – Tabla ; Kalaiselvam – Tala. 9.00 a.m “Selected Pasurams from Divyaprabandham” by N.C.Soundaravalli ; Meera Sivaramakrishnan – Violin ; Manakkal Sriram – Mridangam. 10.00 a.m “Sri Srinivasa Kalyanam” by Velukkudi Sri Krishnan Swami. 6.30 p.m. NITHYASHREE MAHADEVAN – Vocal ; B.Raghavendra Rao - Violin ; I. Sivakumar- Mridangam ; Dr. S. Karthick – Ghatam. 8.30 a.m. Namasankeerthanam by Veeramani Raju & Party. 6.30 p.m. Geetha Krishnamurthy - Veena ; Tirupathy M. Sudhakar – Mridangam ; N. Rajaram – Ghatam. 4.00 p.m. Dr.Subhashini Parthasarathy - Vocal ; V.V.S. Murarai – Violin ; B.Ganapathyraman – Mridangam; Adambakkam Shankar- Ghatam. 6.30 p.m. P.UNNIKRISHNAN - Vocal ; Nagai Muralidharan – Violin; Neyveli Venkatesan – Mridangam ; N. Guruprasad – Ghatam.